PARIS (Sputnik) - French Finance and Economy Minister Bruno Le Maire confirmed on Thursday that the government would not increase the national fuel tax in 2019. "There will be no new tax increase on fuel in 2019. This is a significant gesture toward reconciliation, which was made by the president and the government. This should allow everyone to take part in the debate in order to find a solution," Le Maire said on Twitter. The comment echoes the statement by French Prime Minister Edouard Philippe made on Wednesday: he said that the French government would abandon the idea of raising taxes on fuel and electricity if consultations with trade unions, lawmakers and citizens failed to produce a good solution. The prime minister also proposed holding a nationwide debate devoted to possible changes in the tax system that would last from December 15 through March 1, 2019. The day before, the Prime Minister stated he would suspend the introduction of three fiscal measures, including an increased fuel tax, for six months amid violent "yellow vests" protests. On Wednesday evening, French media reported that the tax would not be imposed at all next year. 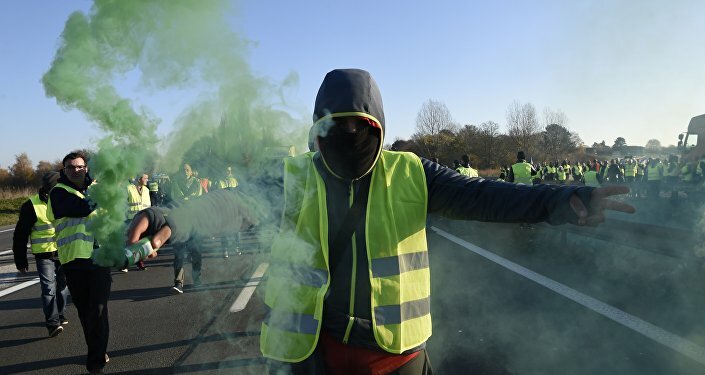 The so-called yellow vests protests, named after the reflective vests all French drivers are required to keep in their cars, have been ongoing in France since November 17. Saturday's "yellow vest" rally in Paris was accompanied by violent clashes between protesters and police, rioting, burning cars, and destroyed stores and banks. As a result, 412 people were detained and 133 people were injured, including 23 security officials. A total of four people have been killed in France since the start of the protests. In late 2017, the French government approved the decision to raise the direct tax on diesel fuel, which is the most popular type of fuel in the country. Diesel prices in France have risen by around 23 percent since the beginning of the year, while the gasoline prices have gone up by 15 percent. Prices were initially set to increase further in January.